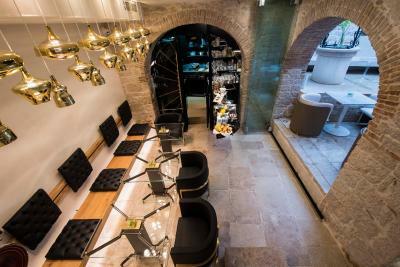 Lock in a great price for Spirito Santo Palazzo Storico – rated 9.7 by recent guests! This place is a gem - very beautiful, boutique location. 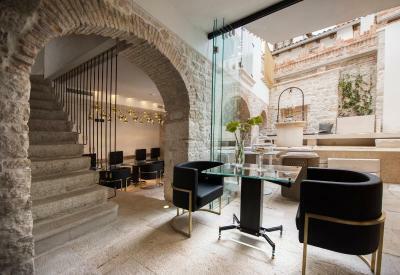 It feels like you are in an old-fashioned monastery converted into a modern hotel. 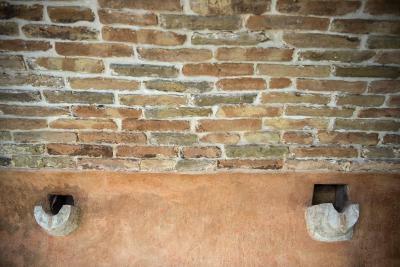 Beautiful stone details (stone walls, stairs, and wells), impeccable service, and comfy rooms. Rooms amazingly beautiful. View from top deck A delightful bonus. We thought we’d died and gone to heaven. Bibicka the cook was so friendly from the beginning waving from the kitchen and coming out to welcome us,like meeting an old friend. The pick up from car park super easy. Was very happy to unpack and never leave. Restaurant recommendations excellent. Breakfast with sparkling wine one if the best our whole trip with fresh eggs, smoked salmon, freshly baked bread and cake. Couldn’t have been better. I cannot day enough good things about this hotel. 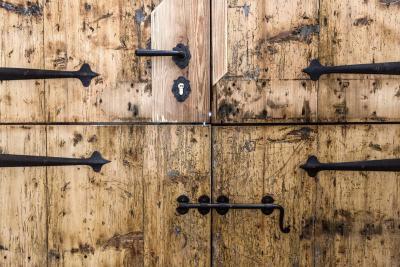 Ever detail has been thought of to make your stay exceptional. From the parking, the welcome glass of champagne, cookies in your room, FAST WiFi, to the most comfortable bedding I’ve ever slept on. What pushes this hotel to the best experience I’ve ever had was the customer service. It exceeded all of my expectations. Ivan and his staff set the bar for customer service. The hotel is also gorgeous and is in a fantastic location! They also treated our dog as well as they treated us! 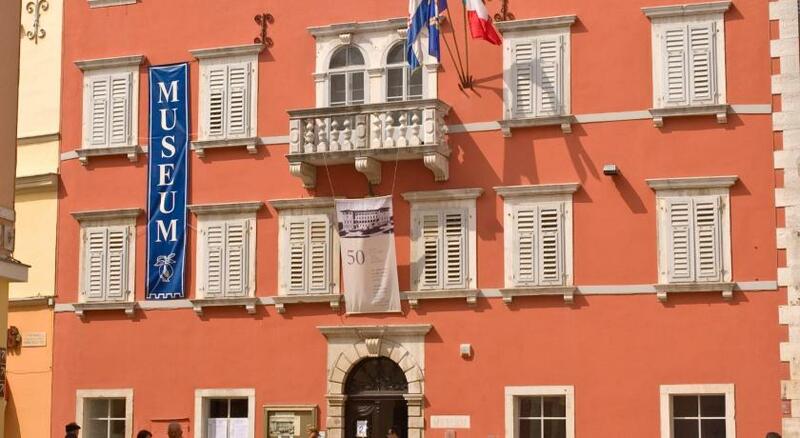 We will only stay at this hotel during future visits to Rovinj! The staff was wonderful - we particularly appreciated being driven to the restaurant for which we had a dinner reservation, where we never would have been on time had we decided to walk... in fact, we never would have gotten the reservation if the staff hadn't made it for us! We usually stay in airbnb's to keep the cost down, but we felt this splurge was totally worth it - we were given a welcome drink and the breakfast was also fabulous! All new with creative design. The staff was amazing, breakfast options were delicious. 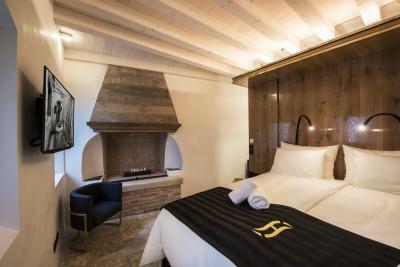 staff was extremely helpful, comfortable and cosy rooms, bed conformity was on high level, every detail in the hotel has been precisely planned and embeded, overall the excelent experiance in the hotel that obviously has been built with love. 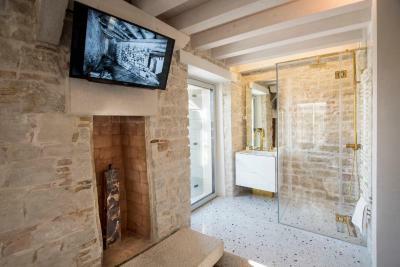 EVERYTHING, beautifully restored and well located old private residence, only 7 rooms, above and beyond service from staff, comfortable room and very nice common areas, great value for service and amount of luxury. Delicious breakfast. Don’t think twice - Stay here if it’s available. 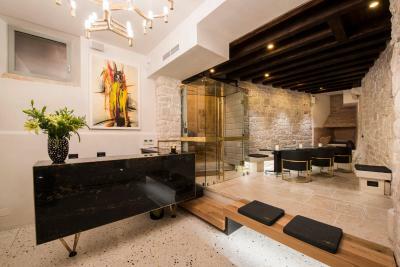 Spirito Santo Palazzo Storico This rating is a reflection of how the property compares to the industry standard when it comes to price, facilities and services available. It's based on a self-evaluation by the property. Use this rating to help choose your stay! 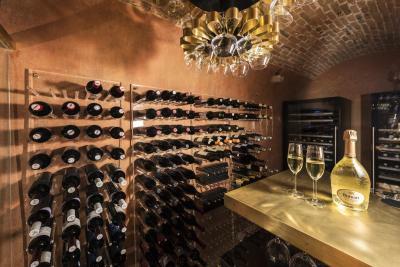 One of our top picks in Rovinj – and a guest favorite. 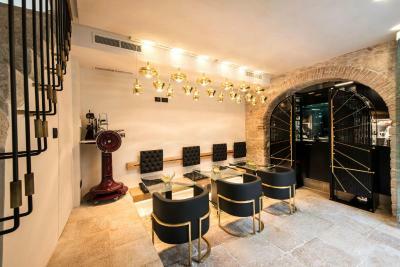 Opened in August of 2017 in the historic town center of Rovinj, Spirito Santo Palazzo Storico is located in a renovated heritage building from the 1920s. 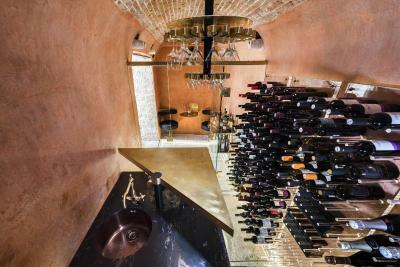 The property has an on-site wine bar and a traditional Mediterranean enclosed terrace with a water well. Free WiFi is available in all areas. All elegantly designed air-conditioned rooms are fitted with a flat-screen satellite TV, a mini-bar and a safe. Private bathrooms consist of a shower, free toiletries and a hairdryer. Extras include bathrobes and slippers. 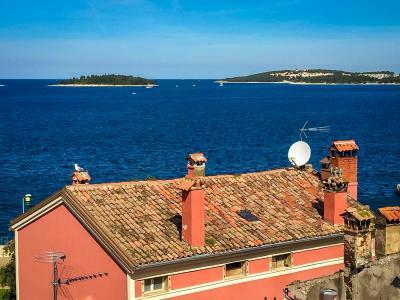 Most rooms offer views of the town of Rovinj. 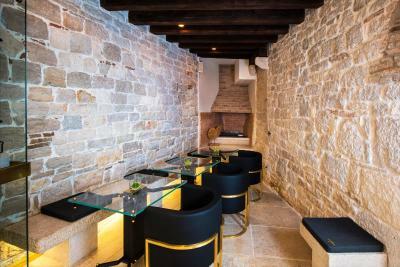 Guests staying in Spirito Santo Palazzo Storico can enjoy a glass of selected wines in the hotel wine vault or taste Istrian and Mediterranean delicacies in the lounge bar that comes complete with a fireplace and a terrace. 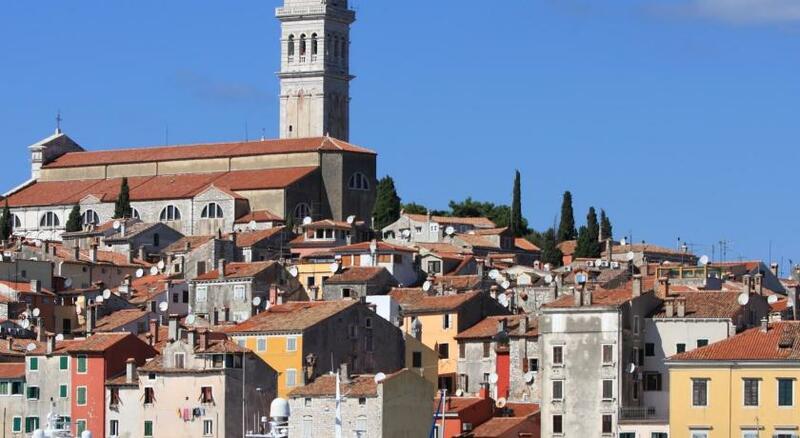 Rovinj Heritage Museum is 1,000 feet from the property, while the Church of St. Euphemia is 2,800 feet away. 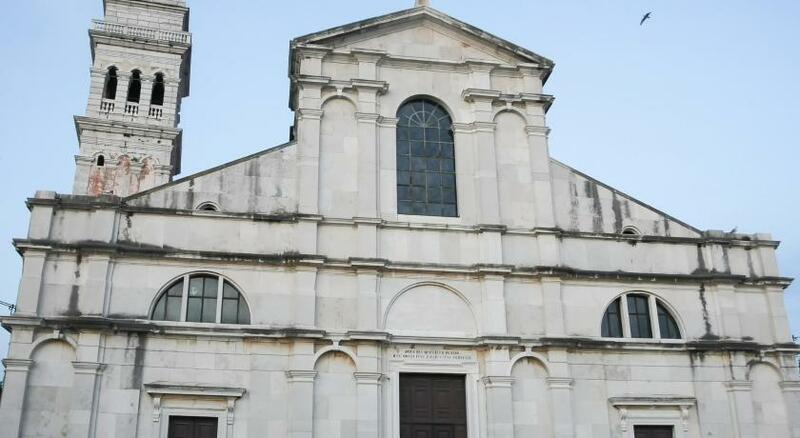 The closest airport is Pula Airport, 25 mi from Spirito Santo Palazzo Storico. Airport shuttle can be arranged at an additional charge. 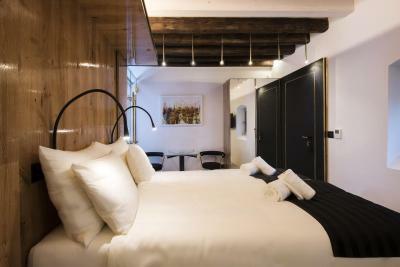 When would you like to stay at Spirito Santo Palazzo Storico? This elegantly designed air-conditioned room is fitted with a flat-screen satellite TV, a mini-bar and a safe, as well as a fireplace and direct view of a traditional Rovinj Old Town alley. A private bathroom consists of a shower, free toiletries and a hairdryer. Extras include bathrobes and slippers. 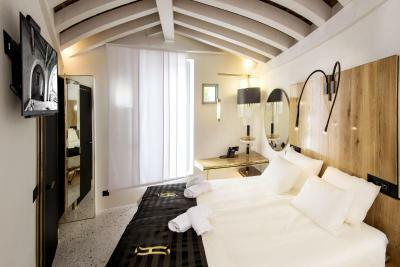 This elegantly designed air-conditioned room offers views of the Adriatic Sea and the Church of St. Euphemia. 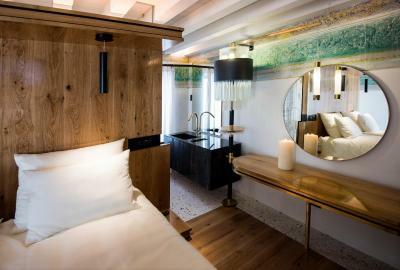 The room is fitted with a flat-screen satellite TV, a mini-bar and a safe. A private bathroom consists of a shower, free toiletries and a hairdryer. Extras include bathrobes and slippers. This elegantly designed air-conditioned room features an enclosed loggia. The room is fitted with a flat-screen satellite TV, a mini-bar and a safe. A private bathroom consists of a shower, free toiletries and a hairdryer. Extras include bathrobes and slippers. 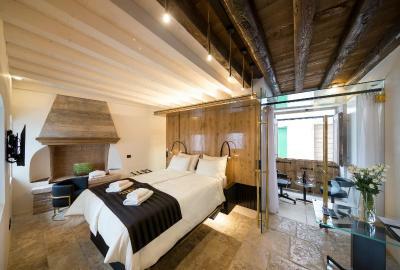 Guests staying in this room also have direct access to the terrace of the hotel lounge bar. 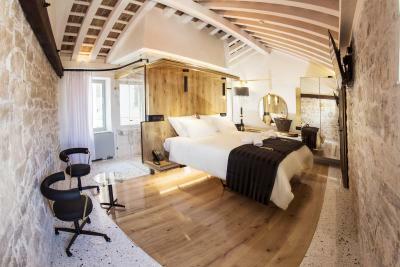 This elegantly designed air-conditioned room features a terrace and offers views of the Adriatic Sea and the Church of St. Euphemia. The room is fitted with a flat-screen satellite TV, a mini-bar and a safe. 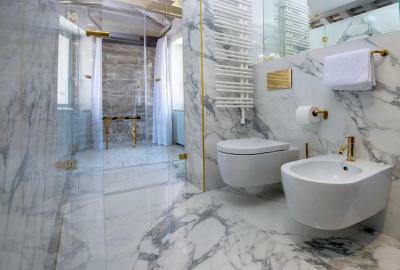 A private bathroom consists of a shower, free toiletries and a hairdryer. Extras include bathrobes and slippers. 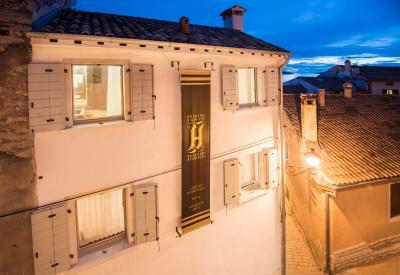 This elegantly designed air-conditioned room is located in the attic and offers views of Rovinj Old Town from the roof windows. The room is fitted with a flat-screen satellite TV, a mini-bar and a safe. A private bathroom consists of a shower, free toiletries and a hairdryer. Extras include bathrobes and slippers. 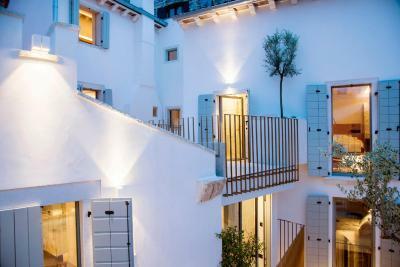 This elegantly designed air-conditioned room features a terrace that overlooks the courtyard of the hotel. The room is fitted with a flat-screen satellite TV, a mini-bar and a safe. 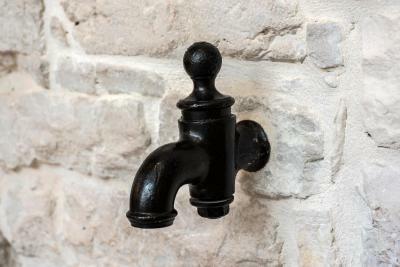 A private bathroom consists of a shower, free toiletries and a hairdryer. Extras include bathrobes and slippers. 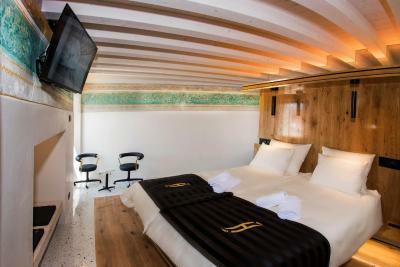 This spacious and elegantly designed air-conditioned room features a balcony and offers views of the Adriatic Sea and the Church of St. Euphemia. The room is fitted with a flat-screen satellite TV, a mini-bar and a safe. 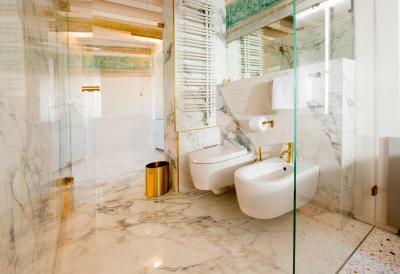 A private bathroom consists of a shower, free toiletries and a hairdryer. Extras include bathrobes and slippers. 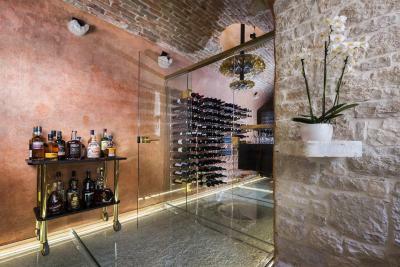 House Rules Spirito Santo Palazzo Storico takes special requests – add in the next step! Spirito Santo Palazzo Storico accepts these cards and reserves the right to temporarily hold an amount prior to arrival. Please note that the rooms are accessible only via stairs. 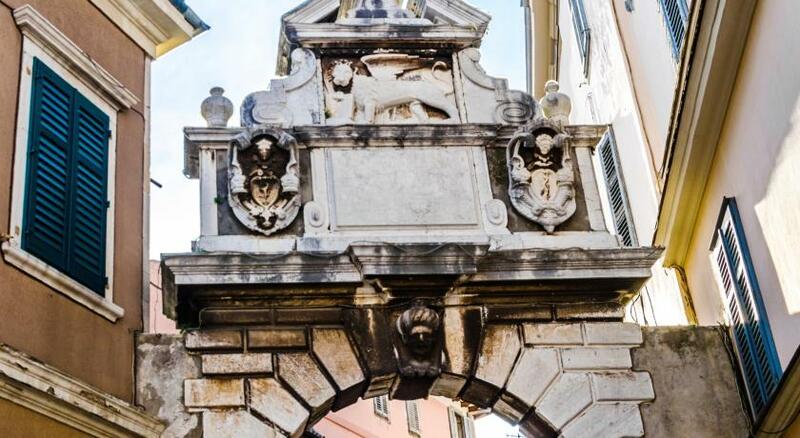 Please inform Spirito Santo Palazzo Storico of your expected arrival time in advance. You can use the Special Requests box when booking, or contact the property directly using the contact details in your confirmation. The hotel and staff are amazing. All to quality. Nothing is too much trouble. The best hotel in every way I've stayed in for years. Really outstanding friendly service from all the staff - couldn't have done more to make our stay special. 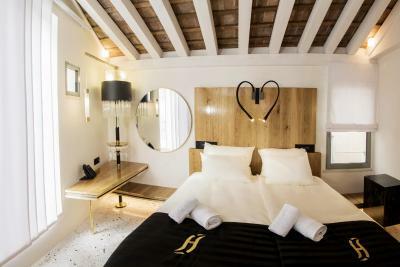 Gorgeous room, fantastic breakfast, perfect location in Rovinj's old town. My friend and I absolutely loved this beautiful hotel. Every little detail was perfect. The staff are so lovely and helpful. Each room is unique - so you won't get a cookie-cutter, perfectly-square room. But we loved its uniqueness, amazing service, and fabulous location. Everything was simply perfect. the staff are very well trained and courteous. The breakfast is superb with champagne and strawberries if required together with crepes and freshly cooked omelettes , scrambled eggs. 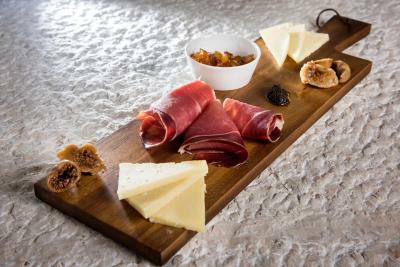 Range of fresh fruits and juices , yoghurts and cheese and prosciutto ; Home made breads made in the hotel kitchen . Very warm , genuine welcome and excellent attention on arrival and efficient booking in administration. The bedroom was supremely comfortable as were all the facilities at this gem of an hotel. Its location is extremely convenient to the town centre ; just 1 minute from harbour and main street. Breakfast was 5 star with a great range of fresh fruit and croissants and delicious home made breads. Staff morale is evidently very high . Rarely do you receive such pleasant and engaging interaction with all levels of staff in any hotel. 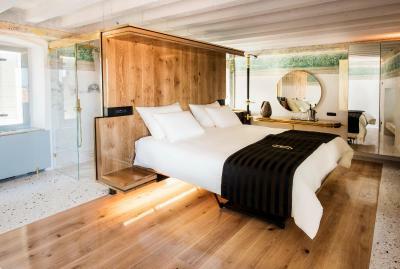 The proprietor Yannis is justly very proud of his architectural design in this 7 bedroom hotel which only opened August 2017. Well is a nice room for couples but a little bit awkward for friends😂, bathroom and toilet are visible if you care about private space😂. 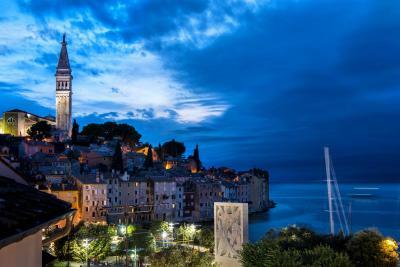 But still, love here and will choose here again if I visit Rovinj. Super helpful staff, nice drive us to bus station and just so kindly for help everything. Room is new, stylish and unique. My room have view for the sea which is just prefect. Nothing - this was 10/10 for us. Wishing we stayed longer. Room with skylights was beautiful, bed was extra comfortable & breakfast was the best we had in Europe, they used the most delicious, fresh ingredients from the local area of Istria. 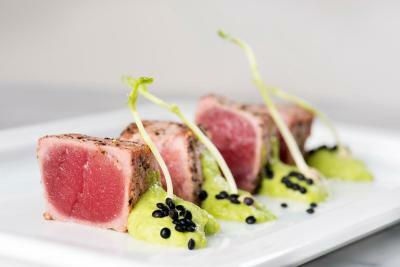 Service was impeccable & staff were absolutely lovely. 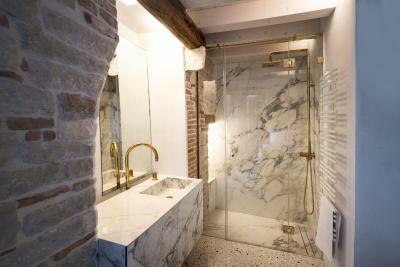 The renovation of the palazzo & finishes are the perfect architectural blend of old meets new. 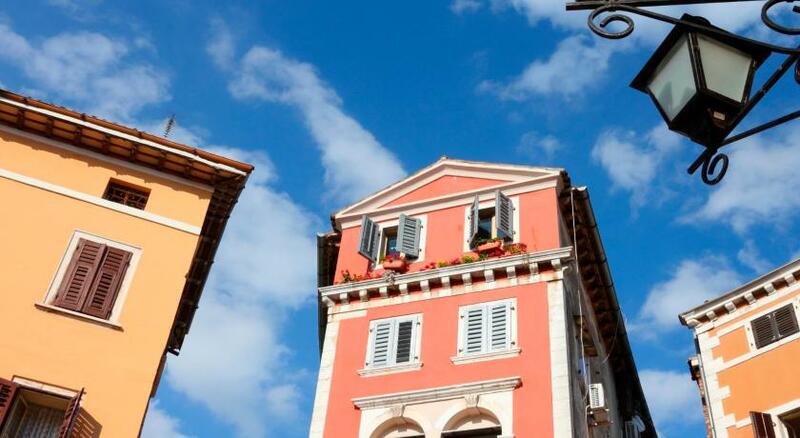 We loved our time at the Spirito Santo Palazzo Storico in Rovinj. 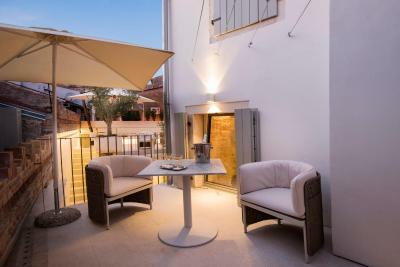 The location is great, very convenient for walking into the old town, and yet has its own private parking nearby. 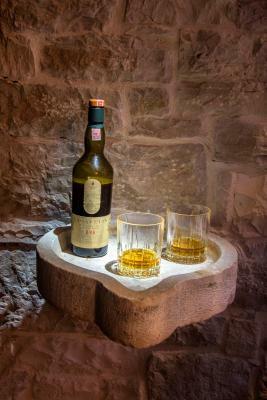 The welcome drink immediately makes you feel relaxed and at home. 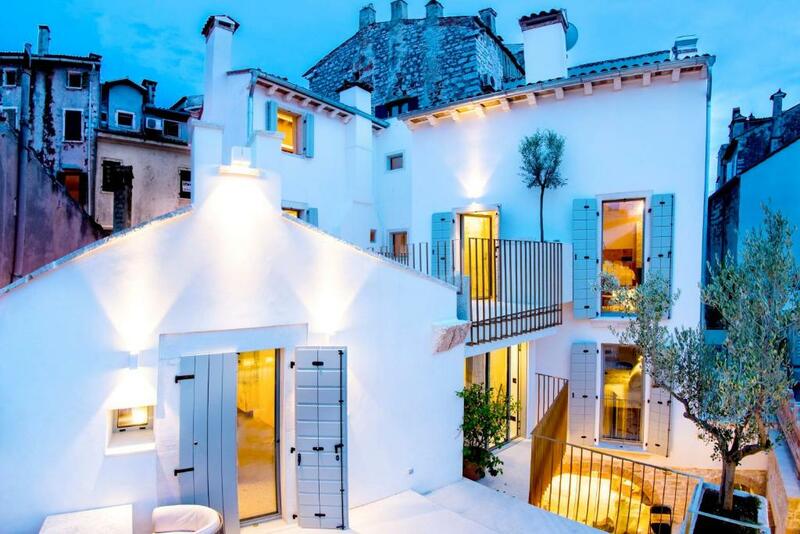 The conversion of 2 or 3 old stone houses has been beautifully done, and our room so wonderfully quiet and comfortable with a lovely terrace overlooking the nearby roofs. All the staff were great, so helpful and friendly. Very tasty breakfast buffet, and lovely courtyard to sit in the evening. Just loved it! Loved the property but sink in rooms was difficult to maneuver with height, automatic drawer below and light dangling in center of sink...each time I used the the sink/mirror, the drawer below kept popping open which was annoying, the light was in my face and the sink was too low for someone 5'8" when brushing teeth. Also, we stayed on top floor which has many steps...if you are in shape or enjoy exercise, this is great. If you are older and have trouble walking, this is an issue. There is not a lift, but the staff were more than happy to assist with getting heavy items up to the room. Lastly, if you drive to Rovinj, parking is at an offsite location, but only a 6 minute walk, and hotel staff is always happy to transport you to your vehicle...will unload your car for your and accommodate you however they are able. I loved the staff, the breakfasts, the beds very comfortable, the location was great and it is a great spot to relax! Lovely property indeed with outstanding decor and fine details. Would stay here again, most certainly! Outstanding staff and beauty of property make this hotel so very attractive. Staff willing to assist with reservations, directions, laundry service and cab service to locations on outskirts of city. Amazing staff, amazing rooms, amazing food, amazing view, only superlative I recommend this place to everyone who is willing to have a beautiful experience. Everything was exceptional. No complaints at all.